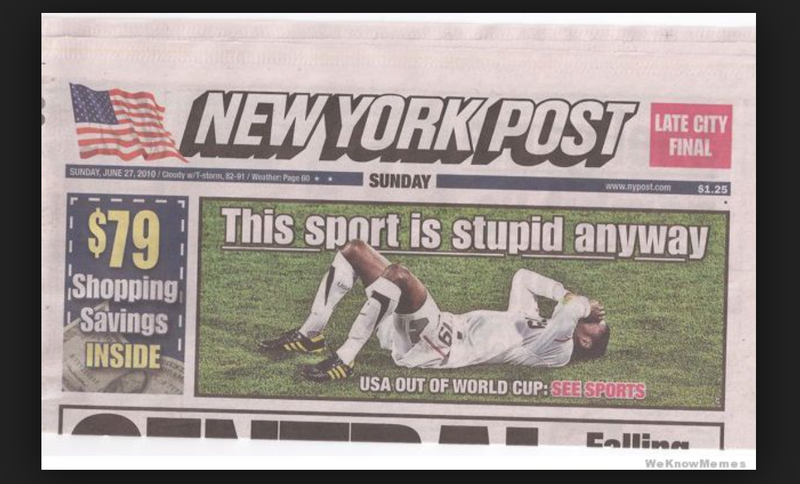 BACK in 2010, The New York Post enraged football fans with a headline about how this was such a stupid game, after the United States soccer team got knocked out of the World Cup by Ghana. The idea here was that soccer, as the game is termed in several places west of England, does not have the same standing, even the same kudos as real games such as baseball, basketball, American Football and ice hockey. Something about this scenario might strike a chord with academics who carry out research in the area of sports, particularly football. Probably, within some segments of academia, popular culture is fair game for ridicule anyway. Even if the Research Excellence Framework aspires towards real world engagement, there remains a sense that we shouldn’t muddy our academic boots on the same field as everyday society. Perhaps football conjures up images of hooliganism, homophobia, bananas thrown onto pitches and lurid tabloid headlines. Yes, the very same homophobia and racism our students might study in Sociology, the hooliganism they might analyse in Criminology or Psychology, and the headlines they might look at in Media Studies, Journalism or English. Throw in the potential for analysis of football club ownership in Business Studies and you’re looking at a topic that’s not located on the sidelines of what universities do but is at the heart of potential interaction with the everyday. Football’s got a key place in Politics and History, especially this time of year as we’re coming up to Remembrance month, as it now is, and memories of the First World War. With this range of subjects you could probably list out a whole team – History, incarnated as Gordon Banks, keeping goal. Politics on the left preferably, somewhere between Bobby Moore and Karl Marx – a Jeremy Corbyn figure perhaps. Law further up the field – so on and so on. But on a serious note, you have to ask why then this topic, this sport with such a major linkage to society, subjects and students can be so undervalued. The reason for kicking off this discussion in the first place is that I have written about issues related to football, alongside other areas of academic interest. Recently, in my workplace, a colleague suggested that because I’m seen to write about ‘football’ some of the other things that I do or write about might not be taken as seriously. On a point of order I’ve never given a presentation on ‘football.’ I’m not qualified to do so. I’ve never been an Alex Culvin or a Paul Campbell on the football field. Generally, when it came to playing the game, I was always in a variation of the Bobby Moore role – left back, but usually in the dressing room! Leaving the play on words behind, I don’t actually write about ‘football’ as an end in itself, any more than the aforementioned Paul Campbell’s work or Jamie Cleland’s work is defined by the context in which they are studying the broader issues of race and homophobia, respectively. I write about language and identity sometimes. I also write about teacher development and about real-world research. All these things are tied together by the notion that our activities are shaped by an interaction between knowledge that we can sometimes refer to as theory and practice, whether in academia or the everyday world. The fact that I have chosen football, in some instances, to serve as a vehicle for examining broader social and cultural issues does not make my work less academic. On the contrary – closer interaction with what we might call the real world and popular culture has substantially improved another vital area of academic practice. That is the development of educational materials for colleagues and for students. By having that synergy of the academic and the everyday, I hope that I’ve been able to create content that is engaging, interactive, relevant, adventurous and above all educational. Being able to switch between references to Etienne Wenger and Arsène Wenger does not detract from someone’s academic knowledge. It’s possible to use the issue of modern day football club ownership as a vehicle for teaching students about critical pedagogy – without even making it explicit that this is what they’re learning. But maybe that’s a good example too of a certain irony. In asking our students to be more critically engaged with the world around them, some in academia are still rooted in notions of hierarchy, detachment and stereotypes of social class. In the particular case I’ve mentioned, the argument seems to be that language and identity reduced to a talk on ‘football’ has no relevance or no value to the subjects I lecture in – Academic English and teacher education. Paradoxically, at the same time, both of these subjects aspire to an increasing interdisciplinarity and relevance to the real-world – to movement beyond a situation where the classroom’s just a bubble of theory in which ideals are voiced but never put into practice. Maybe that’s what some traditionalists want. They want the safe ground of meta-language and theory that never puts itself to the test in the real world. They want to talk a good game that’s never put into practice. Theoretically, they aspire to grand buzz words of criticality, engagement and interdisciplinarity but their subjects are like Lionel Messi managed by Jorge Sampaoli or Pogba by Mourinho – conservative, rule bound and constrained by a lack of imagination. Maybe football’s not the most academic subject in the world. It’s just a game, innit – but then where do the likes of Albert Camus or Paolo Freire fit in? What about the young Paolo Freire, gathering ideas from his experiences of mixing with Brazil’s street children as they played ball in the slums? Would he be treated as a kind of eccentric and barefoot figure whose actions were outside the Church of Academia? Though you can’t credit football with shaping Freire’s ideas about social justice, it is possible to argue that it played a part. And again, isn’t that going to the heart of what we do as academics? We explore one small part of something and hope that through doing so, we can make a contribution to the whole. The study of football can and does make a contribution to academia, but it’s also an easy target for those who scoff at real-world engagement by their actions even if they espouse something different. And that’s my thought for the day – at 8.45am, before the actual working day. Time to stop writing about ‘football’ and engage with the real world … mmmm.. Follow me on Twitter @CharltonMen and check out the non ‘academic’ works that I have published in the past here or the ‘academic’ here.